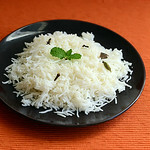 You can use any brand of basmati rice but please read the back of packet for the instructions of cooking and water quantity to get a rough idea.This is the first thing you should do to cook a perfect rice.In this post,i have mentioned the water quantity for India Gate Dubar- Green color packet. 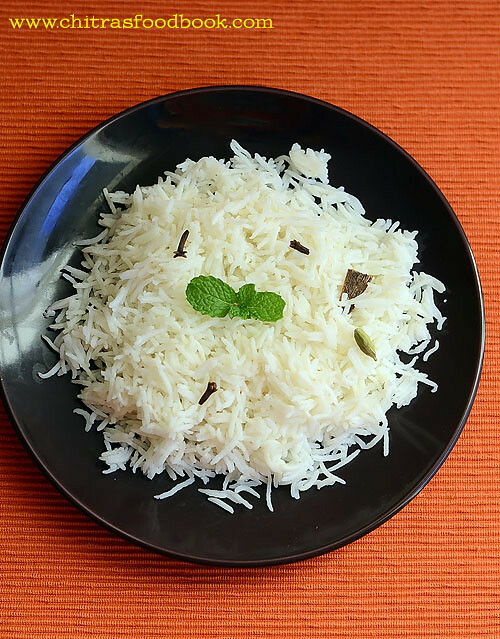 Basmati rice needs a minimum soaking time for 30 minutes to elongate while cooking.As a first step, try to soak the rice before you start making pulao/biryani.It is enough to soak it for a while you chop the veggies and do the grinding jobs if any. You can whole garam masala like 1 cinnamom,2 cloves,1 cardamom,1 bayleaf,1 star anise & 1 black stone flower in the water while cooking. Addition of lemon juice gives you the rice white in color.So wash the rice twice and add lemon juice while cooking to get the nice color. If the recipe calls for more tomatoes or tomato puree,adjust the quantity of water accordingly. Wash and add the rice to the cooker along with sauteed spices.No need to soak the rice.Add 1.75 cups of water for 1 cup of water.Pressure cook the rice in low flame for one whistle.Remove the rice after steam is released.Fluff it with a fork.Please check my Ambur biryani recipe & Donne biryani recipe, Kovai Angannan biryani using samba rice. 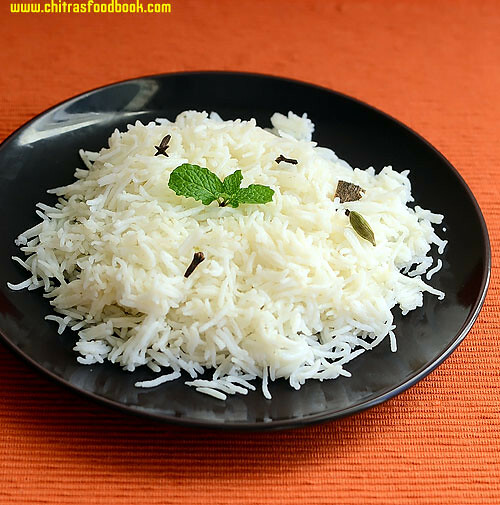 Pressure cooker method: Wash the basmati rice twice and soak it for minimum 30 minutes to maximum overnight. Soking helps the rice to elongate while cooking.So soaking atleast 30 minutes in necessary.Drain the soaked water(carbs would be removed) and put the rice inside the cooker.If you wish,roast the rice for 2-3 minutes in a kadai without breaking the rice.Take a pressure cooker and add 1.75 cups of water if you have soaked for 30 minutes to 1 hour.The quantity of water may differ based on the rice brands & soaking time.Check out the table above.Add a tsp of oil/ghee and squeeze the lemon juice in water.Put the weight valve when the steam is fully up.Lower the flame completely and cook the rice for one whistle.Remove the rice after the steam is released completely.Transfer it to wide plate.Drizzle a tsp of oil and let the rice cool down.Cover it with a lid to prevent drying. Open Pot method: Take the rice and wash it twice.Boil 5 cups of water for 1 cup of rice.When the water comes to a roll boil,add the whole garam masala,few drops of lemon jucie, washed & drained rice.No need to close the bowl.Let the rice cook in open pot in medium high flame for 4-5 minutes.Stir it once or twice in between.When the rice is cooked to 90%( You should be able to break the rice),remove it and drain the excess water in a colander.Collect the hot water in a bowl.You can keep this bowl of water over the lid when you put the rice in dum.Spread the drained rice in a plate and add 2 tsp of oil.Cover it with a lid to avoid drying. Microwave method: Wash and soak the rice for minimum 30 minutes.Keep it in a microwave safe bowl double the size of water quantity ( to avoid water spilling)and add 2 cups of water,a tsp of oil and few drops of lemon juice.Cover the bowl with a microwave safe lid. Cook in high power(800w) for 2-3 minutes.Take the bowl and stir the rice once.Again keep in high power for 2 minutes.Check whether the rice is done.Transfer the rice to a plate and cover it with a lid to prevent drying. Rice Cooker Method:Wash and soak the rice for 30 minutes.Saute the spices as per the recipe and pour 2.5 cups of water for 1 cup of rice.After the water starts to roll boil , add the rice.Check for salt and cover cook for sometime.Cooker will automatically switch to “Keep warm” mode.Open the lid and check whether rice is cooked well.If not add 1/2 cup of water, mix well and again switch it to “cooking” mode.Please check my tomato rice recipe using rice cooker recipe for more details. 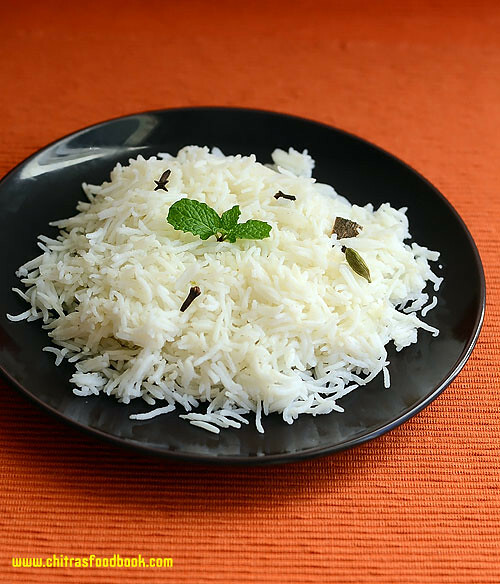 Basmati is considered to be a Healthy”super grain”.It is gluten-free and low in fat. It contains all eight essential amino acids, folic acid, and is very low in sodium and has no cholesterol.Basmati has a low to medium glycaemic index, meaning that energy is released at a slower, steadier rate leading to a more balanced level of energy.Basmati rice builds body tissue and is very rich in prana or vital bio-energy.Basmati rice can be beneficial to certain groups of people. Those on low-calorie diets can benefit from incorporating this grain into their diets since it is so low in fat. However, at slightly over 200 calories per cup, the calories can pile up if not eaten in moderation. Nice post Chitra, love to experiment a few! Happy New year and Pongal wishes! Hi chitra ka.. thank u so much for this post. I have tried so many methods of cooking basmati. But nvr got it perfect, it would be either uncooked or mushy. But ur method is a keeper for me. Tried it so many times in rice cooker. Everytime the rice cooked perfectly. Today I made biriyani using this method in pressure cooker, yay it was long grainy, yet perfectly cooked. My mil approved it for the first time after an yr of my marriage.. hugs to u ka.